Jerusalem will always remain the Capital of Palestine! The MJC (SA) and the International Community condemns the United States of America’s moving of its Embassy to the blessed city of Al Quds. Despite international criticism, the United States officially opens its embassy in occupied Jerusalem today. The MJC joins tens of thousands of Palestinians [and those around the world] who are protesting this illegal move. Jerusalem will always remain the Capital of Palestine! Both the embassy’s move and the protests have symbolic timing. May 15 is the 70th anniversary of “Nakba,” or catastrophe, which led to the expulsion of hundreds of thousands of Palestinians from their homes and villages. “We are adamant to return, no matter what happens. This is what the people of Gaza want – it’s about popular will. And this is their right,” a spokesperson for the Great March of Return, Ahmad Abu Artema, told Al Jazeera on Monday. 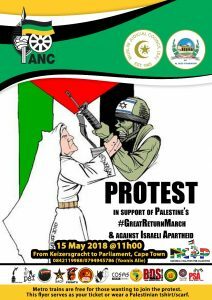 Meanwhile, South Africans will be showing their support for the Return of Palestinians to their land tomorrow as they participate in the #GreatReturnMarch in Cape Town. 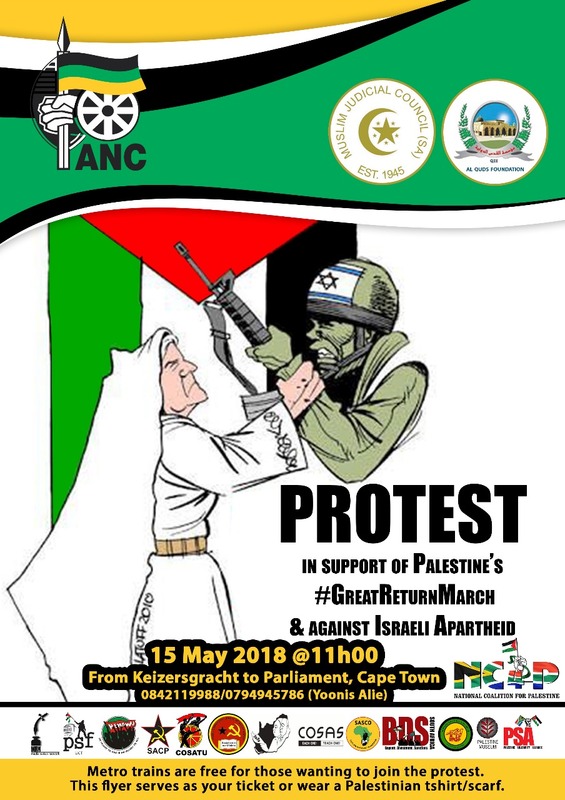 The protest starts at 11 am from Kaizergracht Street.